The complete eco-friendly plant defender and invigorator. Controls Aphids, Whitefly, Red Spider Mite and a range of other pests without using chemicals. Protects against powdery mildew and other leaf diseases by physically strengthening the leaf surface. Nourishes and invigorates the plants for strong, vibrant root, shoot and leaf growth. Pesticide free - safe for children, bees, and pets. Can be used on all plants. 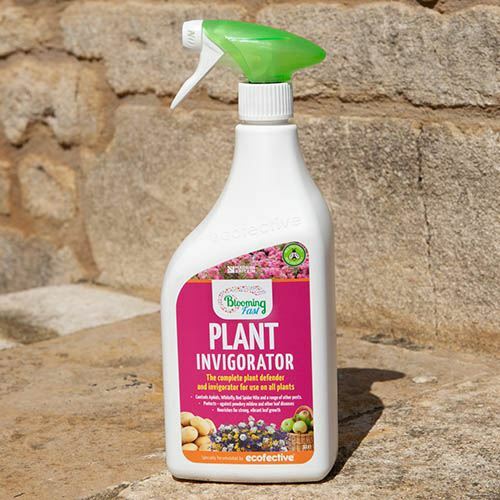 Keeping a disease and pest-free garden that is also child and pet-safe is easily achieved with our Plant Invigorator and Defender: a ready to use, pesticide-free spray for use on ornamentals and edible crops. Specifically formulated in the UK to be kind to the environment, you can control a wide range of pests including Whitefly, Aphid, Red Spider Mite, Mealybug, Scale and Psyllid as well as protecting against powdery mildew - all without the use of pesticides. The unique 3-in-1 formulation CONTROLS by turning the bugs sticky and unable to move and feed off the plant, (without making the plant sticky). PROTECTS against powdery mildew by removing spores from the plant, and finally NOURISHES by feeding through the leaves on application. Due to the physical mode of action of the Defender and Invigorator, pests will not become resistant to the application, so you can continue to use it effectively, safe in the knowledge that your children and pets are protected from harmful chemicals - plus, they don’t need to be excluded from the treated areas as there is no harvest internal. Supplied in a 1 litre, ready-to-use container.